A lot of people have requested me to make new unique dual purpose guitar pedal with clean sustain and overdrive that can be used with chords. I am proud to announce the Voodoo-Blues a revolutionary new design which can be set to provide both overdrive and clean boost. I have over the years repeatedly refused to make an updated copy or clone of the Tube Screamer because I personally was never happy with its nasal tone and lack of detail and dynamics. A new innovative design approach was needed to make a unique product that would be a significant improvement. The Voodoo-Blues is the result. A unique new guitar effects pedal that uses a completely different circuit to produce a set of very musical overtones with feed forward compression as it slips into overdrive. The full dynamics and detail of the guitars tone are faithfully preserved and the unit cleans up perfectly with the guitar Volume control. I urge you to compare the Voodoo-Blues with any type of overdrive pedal for you to "EXPERIENCE THE DIFFERENCE" and not agree that it does its job beautifully and gives the discerning player an alternative for those who demand this type of overdrive. Our "FORWARD EVER - BACKWARD NEVER" approach to effects design has fuelled our success since 1964 and has enabled us to move the goal posts forwards again setting new benchmark standards. The output level is high enough to drive the 1st Stage of Tube Amplifiers into distortion if required and the Fatness control does what it says and is not just a simple EQ section. It has all the usual features of our Voodoo-Series pedals and is a welcome addition to the range. Don't imagine that it can only be used for Blues as its characteristics lend itself very well to Rock and Country as well. 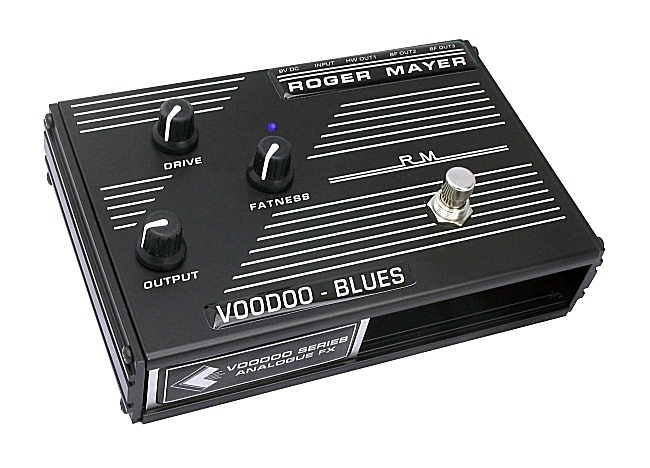 The Voodoo-Blues is housed in our Standard Style enclosure with both dual direct drive buffered outputs or hard wire output and has a rapid change 9V battery compartment.